I think she seems like a ghost, what do you think? I think it turned out pretty good. She has a bit of that " big eyed girl" current look that I usually try to avoid, but I can live with that. I used my favorite colour combo, black purple and gray, and that alone makes me like it. If it doesn't sell in 4 months I am totally keeping it! She is in the shop, and I put her at a competitive (is that the word I am looking for?) price for an original painting. :-) Cheap is what I mean. I had planned to post two paintings, but it is too dreary a day to get good photos of the other one. Plus I might hate it, so I need to stare at it for another day. So tomorrow. She's fab... know what you mean about having to stare at stuff before you post it...I worry about blogging about half my stuff as a fair bit of what I make never gets to the shop. I put it in a holding bay (bottom of the wardrobe, away from Kitty claws) and if I still don't like it after a few weeks...in the bin! Big eyed is the only girl I work with ;3 She's very pretty! 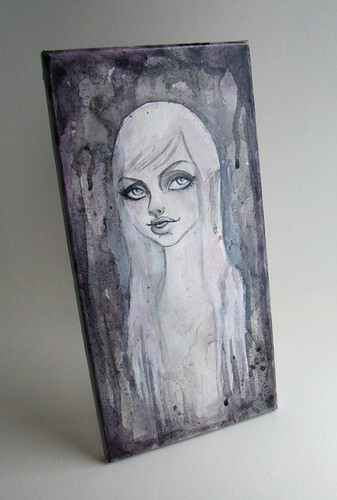 Reminds me of a vacant house, with a ghost girl gazing out of a window on a rainy day! Very awesome effect on this one. This painting has your eyes! She is wonderful. I love how the painting has a dripping and pulling down look about it. Great emotion. She seems strangely at peace. she looks innocent but a bit mischievous.